Top class children’s entertainer from Manchester. His Comedy Magic Show and fun games are the perfect choice for birthday parties or events, he can also run all the games too with his fun hassle free package – this includes disco games, limbo and pass the parcel with a mega fun twist! You can also book his “walkabout” magic rather than a show. This is mix and mingle close up magic for fairs, fun days, shopping centres and events! The perfect choice for children’s birthday parties, Christenings, fun days and events. He is based in Bury near Bolton and will also travel all over the North-West, Cheshire and parts of Yorkshire etc for your special event.Wacky Woody is the kid’s magician who will leave a lasting impression with kids and adults alike! Comedy Magic Show, Games, All the games and disco games played are non-elimination. This means that all children can be fully involved in the party for all of the time and nobody is “out”. These parties are uproariously funny and very, very silly! Aimed at 4 – 11 year olds, the show provides the perfect blend of hilarity and bemusement. This magician always has the kids in stitches and always leaves them amazed!! 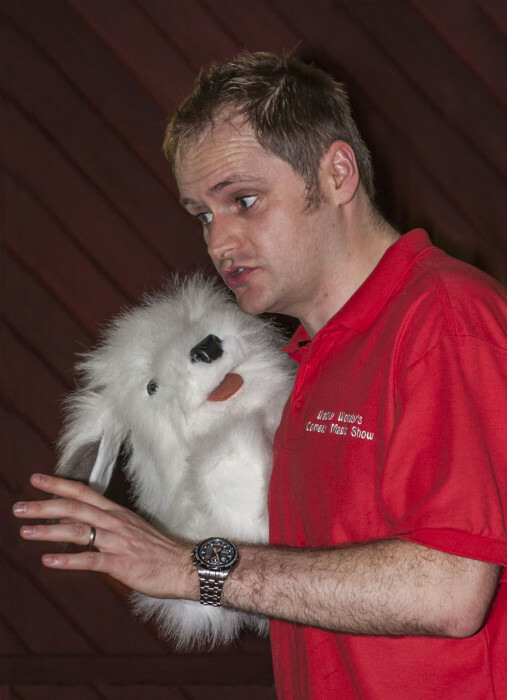 Comedy Magic Show and games packages are ideal for children’s parties. And this children’s entertainer will travel all over Manchester and surrounding area’s as well as Cheshire, Lancashire and parts of Yorkshire. The performance given was a 100% and very professional. To be able to keep 20 Beavers, 2 Young Leaders and 4 Adults entertained is no mean feat. Performed on live shows on BBC2 and ITV and I starred in “It’s Adam and Shelly” (BBC3), Comedy Shuffle (BBC2) and Emmerdale, as well as providing voices for Comedy Radio Drama on Radio 4. Previous Clients: Tui (Thompson) including at their 5 Star Sensatori Resorts in Egypt, Crete, Cyprus, Ibiza and Turkey. I also work for Warner Leisure Hotels at their amazing venues throughout the UK.